Also known as a Matfer mold, this utensil is used for making a traditional Polish cake known as a Baba Cake. The small Baba Mold is available in various sizes which range from 1.5 to 2.5 inches tall and 1.75 to 2.5 inches in diameter to hold 4 to 6 ounces of contents. The aluminum or steel mold may be made with a non-stick coating on the inside to assist with the removal of the small round cakes after they have baked. The Baba cake which may also be referred to as a babas au rhum cake is made with a rich butter and yeast dough that contains dried fruits such as raisins enhanced with a rum flavoring. 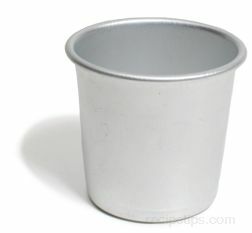 A Baba Mold may also be used to make individual servings of brioches mouselines, bouchons, or vegetable and fish mousses.